If it sometimes seems impossible to look good while you're working hard, take a look at these Wrangler Workwear Men's Charcoal WP70 CH Plain Front Canvas Work Pants. Just like you, they perform like a pro, and they keep their good looks no matter what the work day ... (see full details) (see specifications) #WRGWP70CH. If it sometimes seems impossible to look good while you're working hard, take a look at these Wrangler Workwear Men's Charcoal WP70 CH Plain Front Canvas Work Pants. Just like you, they perform like a pro, and they keep their good looks no matter what the work day brings. These men's canvas trousers are made in a 7.5-ounce canvas weave for workwear that's tough and still comfortable. A tight canvas weave resists wind and water, yet still feels wearable. Made in a combination of 60% cotton and 40% polyester, these canvas pants deliver the soft breathability of cotton plus the lightweight durability of polyester. The result? Durable pants that look professional, feel comfortable, and wear well. Working is hard enough, and taking care of your work clothes shouldn't add to your load. Finished for color retention, soil release, and wrinkle resistance, these pants stay looking sharp wear after wear and wash after wash. Caring for them is easy; they're machine washable at home or industrial wash, light soil. This workwear is made with double-needle stitching for a clean design and durability. Because two threads are used, not just one, this stain-release workwear is more durable for workplace wear. Wider and longer belt loops are made for work belts. The fit is ideal for working, too. With a lower rise than traditional work pants, this pair fits comfortably for a stylish, modern fit. Thanks to the full inseam gusset, you'll be able to move comfortably in these wrinkle-resistant bottoms. They make it easy to squat, bend, lift, and climb, instead of fighting you at every move. Darts above the back pockets help deliver a better fit, too. The slacks-style 13-inch deep reinforced pockets provide ample storage with a smooth look, and the set-in back pockets with a button on the left pocket complete the professional appearance. In charcoal grey, they'll go with everything. You're a pro on the job, and these professional-looking trousers help you look the part. Order your Wrangler Workwear Men's Charcoal Charcoal WP70 CH Plain Front Canvas Work Pants from Working Person's Store today! 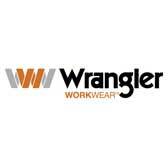 Wrangler Workwear Pants: Men's Charcoal WP70 CH Plain Front Canvas Work Pants is being added to your cart.